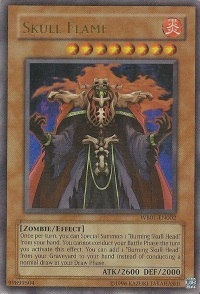 Card Text: Once per turn, you can Special Summon 1 'Burning Skull Head' from your hand. You cannot conduct your Battle Phase the turn you activate this effect. You can add 1 'Burning Skull Head' from your Graveyard to your hand instead of conducting your normal draw during your Draw Phase.